Nearly everyone can admit to an admiration of the color, mystery, and sheer imaginative variety of one of the most beautiful and smile-inducing elements of our world… Flowers! Not everyone, however, possesses the passion and enthusiasm for botany that Charlotte Withersby does – in fact, her entire life revolves around researching, documenting and collecting flowers. Just who is Charlotte Withersby, you may ask? 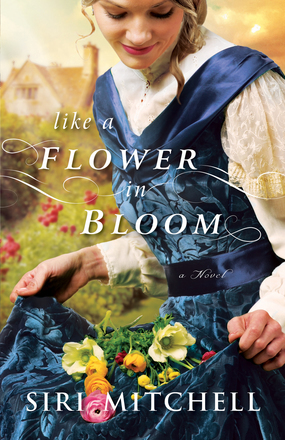 She is the delightfully unorthodox heroine of a new Bethany House historical novel, brought to life by author Siri Mitchell in her latest inspirational release, Like a Flower in Bloom. Set in England in 1852, this captivating story captures the struggles of one young woman who, although fictitious, represents true historical circumstances surrounding the study of botany. According to an author’s note from Ms. Mitchell, up until the mid-1800s the primary contributors to the specific field of science were women and clergy, both parties largely interested in illuminating God and enriching faith. After this time, however, professional academics began to take control of the majority of botanical studies – predominantly leaving women out of the picture. With this fascinating background, a personal story is brought to life through the first-person eyes of Charlotte Withersby, researcher and assistant to her acclaimed botanist father. Holding tight to this identity, Charlotte’s life is turned inside out and upside down when her replacement unexpectedly turns up on their doorstep – leaving her free to pursue the socially acceptable activities required but foreign to her. The list includes attending parties and other social functions, dressing accordingly for each occasion (without wearing the same outfit twice) and, oh yes, finding a husband before she falls any further into the abyss of old-maidenhood… The only problems? Charlotte doesn’t want to leave her research behind, she has no interest in being married, and she can’t tell the difference between a travelling suit and an evening gown. With refreshing wit and whimsy, Ms. Mitchell weaves a unique and engaging story filled with unexpected humor and enchanting characters. A meandering plotline takes its time reaching the climax, but each chapter along the way is entertaining and amusing. Various themes portrayed are certain to resonate with many readers, including discovering the true source of your personal worth, and living according to your life-purpose – not the desires of others. The biggest faults may be that humor occasionally borders on eye rolling silliness, and random comments approach inappropriate content for Christian fiction. Overall, however, Like a Flower in Bloom is a unique delight written in a fun and engaging voice. If you enjoy historical fiction in the inspirational genre, sympathize with characters who just don’t ‘fit in’, and have ever admired a flower – well, this book is for you! This entry was posted in Book Reviews, Christian Historical Fiction and tagged Bethany House, Botany, England, Humorous, Siri Mitchell. Bookmark the permalink.